Discover Bali’s white sand beaches, majestic temples, and unique culture on this 7-hour private tour. Swim in the warm waters of Nusa Dua Beach, join the surfers at Padang Padang Beach, then watch the sunset and enjoy a spectacular Kecak fire dance show at Uluwatu Temple. Hotel pickup and drop-off. Your tour begins with pickup from your Bali hotel around midday. Traveling by private vehicle, set out to the first stop of the day, Nusa Dua Beach, where you’ll enjoy an hour or two of free time to swim, snorkel (snorkelling equipment not included), or sunbathe. Continue to Padang Padang Beach, a popular surf spot and a filming location from Julia Roberts’ movie “Eat, Pray, Love”. 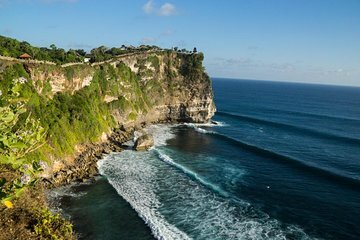 Meet back up with your driver for the short drive to Uluwatu Temple in time to watch the sunset from the coastal cliffs. Before you leave, watch a dazzling performance of the Kecak fire dance, an ancient Balinese tradition, performed in front of the temple. After an action-packed afternoon, your tour ends with drop-off at your hotel around 8pm. I have already mailed across my concern and feedback regarding this tour a week back but haven't heard anything from you guys as yet. we were picked up by a young driver who greeted us and was nice enough to put music on for us for the drive, during the drive there we weren't told much about the surroundings turned up to the first beach not knowing it was time to get out due to no communication, was not informed what beach we were at, i had to ask he seemed very closed the same happened with the following beach we were told to wander it for 2.5hours on the one beach he did not show us around or tell us about the place very much had to figure it out yourself if you want information about the beaches you go to. during visiting the uluwatu temple was gorgeous scenery we arrived super early and had to walk around for 1.5 hours on our own again. our driver purchased the tickets and told us to wait for the show to start then a huge thunderstorm started my self and cousin were soaked as no umbrella was provided and in previous tours this was available we ended up not completing the tour and asking our driver to take us home early did not see the dance or go for dinner. i felt the tour gave to much time for what was actually in the tour.